Awhile back, I shared the mid-century house I lived in several years back. Been thinking about that house a lot lately so thought I would share once again . . . It’s just a distant memory now. A place I laid my hat for a few years while living in the mid-west where architecture like this on a dreamy lot at the edge of the woods is attainable. Not worry free (I had my share of plumbing problems and the scare of two 30 ft. oaks going down just inches from my kitchen) but attainable none the less. The house was built in 1964 by a local architect, John Findlay and his wife, who literally rolled boulders around the lot themselves. The house takes advantage of a sloping landscape and what looks like a small one story dwelling from the street, has a large lower level walk out making the most of an indoor/outdoor living concept. But most of my time was spent on the main level where the kitchen, living room and bedrooms surround an open plan central dining area. While the large eat in kitchen might have sold the house, it was the living room that I liked the most with its iconic stone fireplace and large windows framing an hypnotic view of the woods. The house looks beautiful all surrounded in greenery but it was in the winter, when the trees were bare and the light reflected off the snow, that this house was truly spectacular. I often wondered if the architect who designed and built the house at just 32 years of age (he would die 8 years later), planned it that way or was just lucky? At any rate, I feel the lucky one having lived here even if for a short time. I recently moved into a 1920’s building known as “The Castle” laden with very ornate details — intricately carved beams, a huge carved fireplace surround and even more carvings above the archways all painted out in white and accented by medium stained 3 panel doors with medallions in each panel, cove ceilings, sconces and the like. A far cry from the clean-lined, modern, loft-style apartment I was coming from. While I love the juxtaposition of modern and antique (I seem to be moving more and more in that direction the older I get) for this space I needed to up the feminine quotient to make the pieces I had work together with the architecture. Pictured are the elements that pushed me in the right direction. And surprisingly, the only thing I had to store away was some of my artwork — less so for its modernity and more because all that detail didn’t leave very much wall space to be had. On top of that, moves had to be bold to break through all that ornamentation — the 19th century Debufe painting as window blind is 5 x 6 ft BIG (and has the added duty of hiding a most unpleasant alley view), the large bed floats in the middle of the room backed by a full wall of drapery making for real drama. I’ve only been here a little over a month and there are still many things to be done but so far so good. I’m feeling right at home showing my more feminine side. Movin’ on up . . . to Los Angeles. Can’t wait! And I’m lucky enough to call this amazing art deco bathroom mine. 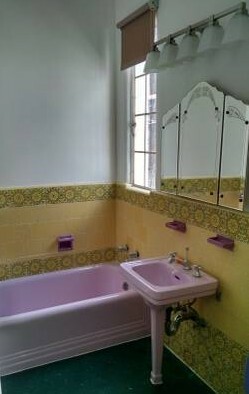 With its lilac & raspberry porcelain, hunter green floors, yellow & floral tiles and original etched mirror — somehow it just all works and is one of the most beautiful bathrooms I’ve ever seen. I love that LA has so many historic buildings to choose from. And I’m super excited to re-explore this city. But in the meantime, I’m going to take a little break while I find work and settle in. Happy New Year everyone! Back soon, I promise. 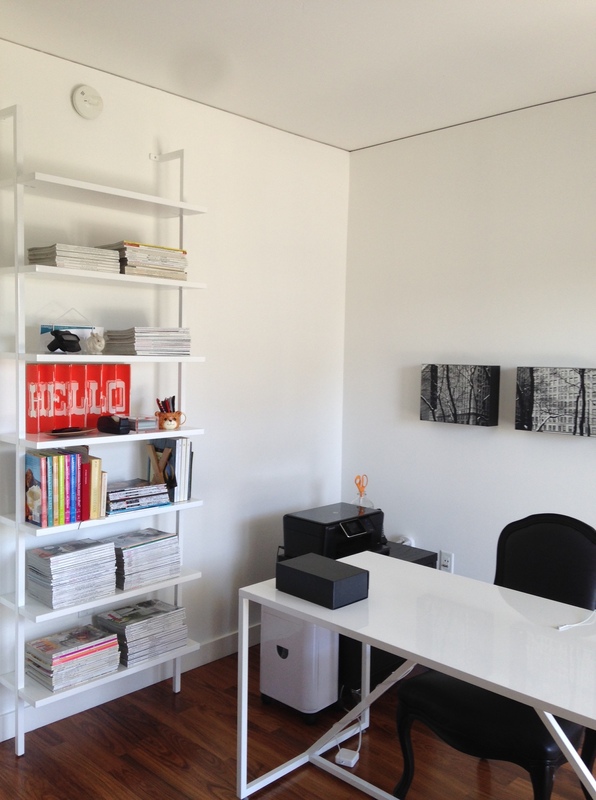 To go in my new black and white office, I need white shelving. But what to do? I’ve narrowed it down to four options. Freestanding, books only, tall as the sky and more unusual. 1. Room & Board Slim collection with fixed shelves and a deep profile | 2. 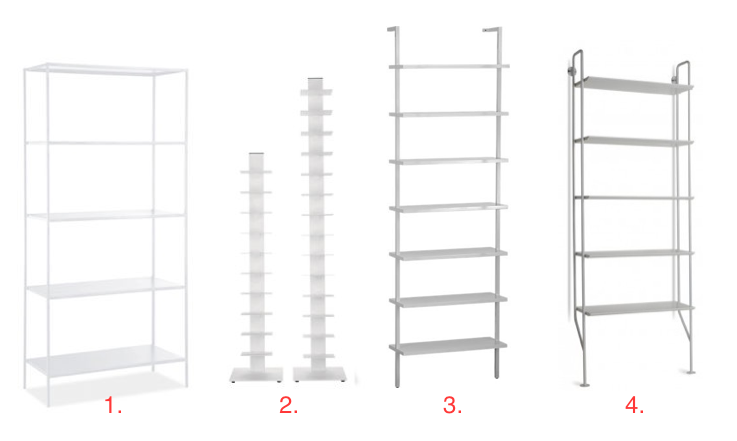 Sapien Bookcase from Design Within Reach (easy to move and fit into future spaces) | 3. Wall mounted 8 foot, shallow, square cut from CB2 | 4. Blu Dot also goes shallow but with a unique shape. Stick to a neutral color palette and you can easily mix styles and textures to make for a stunning environment — even on budget as I have done here. All of these pieces have recently found their way into my new home. Warmth comes from the walnut stained floors under foot and a few treasured wooden tables, chairs and accents I already had. Same client, different city. Award winning Arent & Pike design a pied-a-terre in New York’s Greenwich Village for their Sydney based clients. A little over a year ago when I was in Sydney, I looked up an acquaintance that I had met while traveling in Hobart the previous spring. We met for a walk along the beach, had a lovely breakfast and then to my utter delight, she graciously invited me back to see her home — a modern stunner, high on a hill overlooking the city. The newly remodeled house shown here, has recently been nominated for Best Residential Design by the 2014 Australian Interior Design Awards. Hear, hear! Architecture by Stephen Buzacott; Interiors by Arent & Pyke.